I love hosting parties. Sadly, this is a party that just wasn't meant to be... I had to cancel it at the last minute, due to unforseen circumstances. But I had already done a lot of the planning for the party - so I thought I'd share the details of my Crafternoon Tea Party. The idea was to get a small group of girls together for tea, treats and crafts. That's my idea of a good time! 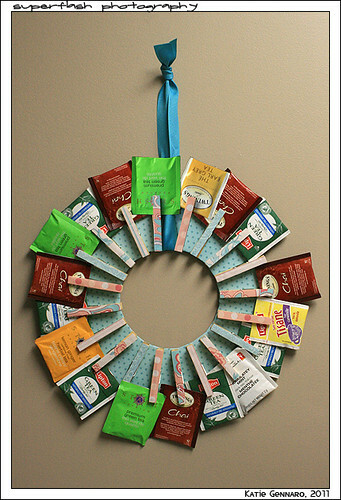 The first thing I made was this tea wreath, originally seen at kojodesigns. It's super cute because it matches my turquoise kitchen, and it displays most of my tea (Not all... most of my tea is not individually wrapped LOL). 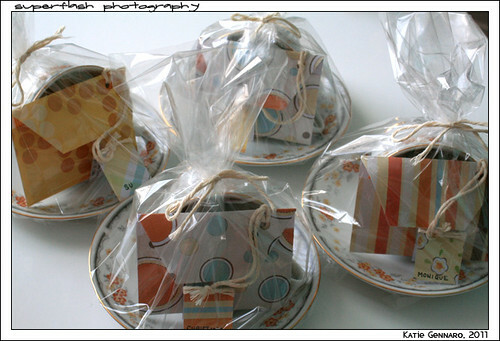 For party favours, each guest was going to receive their own tea cup. 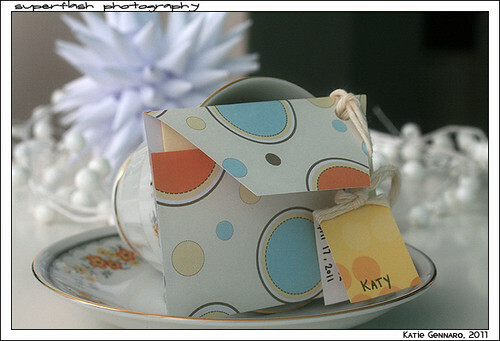 I made little envelopes and personalized them with the guests' names and the name of the party. (Tutorial coming soon!) They were wrapped up in cellophane, and tied with cotton twine that matched the tag on the envelopes. I made the bouquet starting with a vintage Pyrex mug that I found at a thrift store. Inside, I placed some white clay, and I poked some little sprigs that I found at the dollar store into it. I made the flower on the left using this tutorial found at Homemade Ginger. 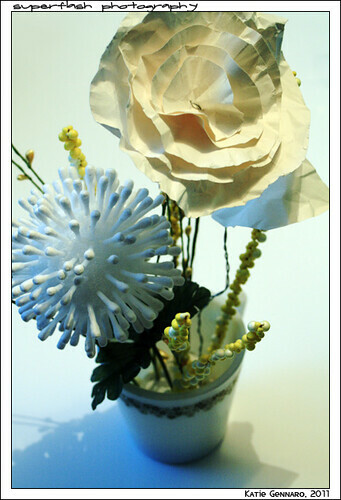 The flower on the right, I made by cutting different sized circles out of regular craft paper, crumpling them up, and then layering them one on top of the other, then piercing them with wire. Would've been a great party, if I actually could've thrown it! Alas, it was not meant to be. Maybe another time. Hope someone out there can use these ideas for a party! DAAAAAANG, I would've LOVED to be at that party...looked like awesomeness! Oh no! Why did you cancel? I swear once I buy all my crafts, I'm coming over! You are awesome!! I live vicariously through you in crafting!